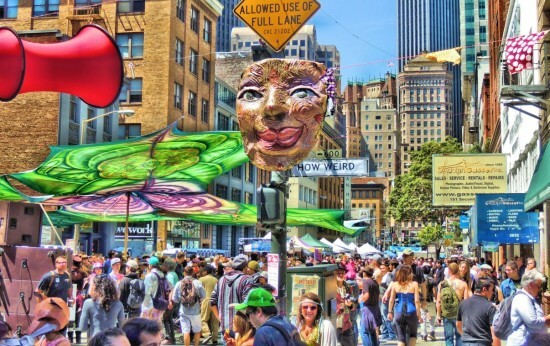 On May 5, 2019, a unique gathering of the tribes will occur in downtown San Francisco for the 20th annual How Weird Street Faire. For one day only, in the emerging heart of downtown San Francisco, there will be a sensational spectacle. Join thousands of people in colorful costumes from around the world, who have come together to celebrate peace, creativity, and weirdness. There will be dancing in the streets at 9 stages of world-class electronic music, spectacular performances, fantastic foods, unique vendors, visionary art, and inspiring creativity. The theme for 2019 is “Time Warp: A Love Story”, looking back at the 80s as well as 20 years of How Weird and all time. Time is art. Time is motion. Time is weird. Become a chrononaut at this year’s faire, and take part in a dance-off between the 1880s and the 1980s. 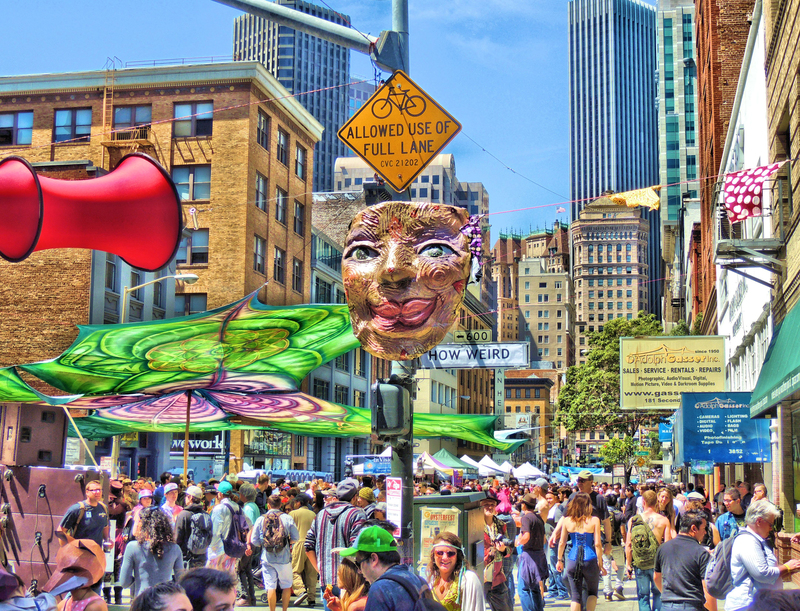 The heart of the emerging new downtown of San Francisco, at the intersection of Howard & 2nd Streets, will be the center of festivities, surrounded by thousands of people in colorful costumes. The How Weird Street Faire is a menagerie of attractions, including a world renowned music festival featuring a wide range of different styles of dance music, an open air art festival we call Art Alley, a collection of yummy beverages and delicious food trucks, and a platform for performers of every type. The faire is from Noon to 8pm. Get there early to enjoy all of the fun. How Weird is centered at Howard and 2nd Streets. The faire is located in the SoMa district, what has become the center of the technology industry for the city, and perhaps the world. This year, the four main entrances to the faire are at Howard and 1st Streets, at Howard and New Montgomery Streets, Folsom and 2nd Streets, and at Mission and 2nd Streets. Everyone is requested to come in costume to the faire. Come as the you you’ve always wanted to be. Come as a character from the 1880s or the 1980s, or both. Be something colorful and inspiring and weird. Weird is always in style. It is recommend taking public transportation to the faire. The How Weird Street Faire is located a short walk from Market Street and the Montgomery BART station, as well as Caltrains Station, Transbay Terminal, and many MUNI lines. *Early bird passes will be $11.11 for a limited time. *11.11 Early bird presale sales ended.